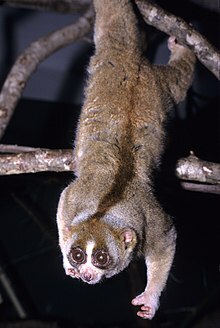 Slow lorises are the genus Nycticebus, nocturnal species of strepsirrhine primates. 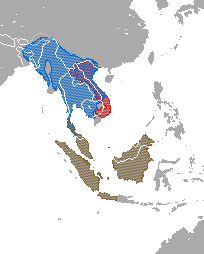 They live in southeast Asia and nearby areas. There are about eight species: the Sunda slow loris (N. coucang), Bengal slow loris (N. bengalensis), pygmy slow loris (N. pygmaeus), Javan slow loris (N. javanicus), Philippine slow loris (N. menagensis), Bangka slow loris (N. bancanus), Bornean slow loris (N. borneanus), and Kayan River slow loris (N. kayan). The group's closest relatives are the slender lorises of southern India and Sri Lanka. Their next closest relatives are the African lorisids, the pottos, false pottos, and angwantibos. They are less closely related to the remaining lorisoids (the various types of galago), and more distantly to the lemurs of Madagascar. Their evolutionary history is uncertain: their fossil record is patchy and molecular clock studies have given various results. Slow lorises eat insects, small birds and reptiles, eggs, fruits, gums, nectar and some vegetation. A 1984 study of the Sunda slow loris found its diet was 71% fruit and gums, and 29% insects and other animal prey. A more detailed study of another Sunda slow loris population in 2002 and 2003 showed different dietary proportions: 43.3% gum, 31.7% nectar, 22.5% fruit, and just 2.5% arthropods and other animal prey.